I set the Sony HDR-AS30V atop a tripod, told it to take photos at 5 second intervals, then stitched the images into a Youtube video. It won’t go viral, but watching the spider construct her web over the course of two hours was fascinating. She finishes the spiral at about 1 m video = 1.25 h real time, settles down for what might be a nap (it’s hard to tell with spiders), and has an insect join her for supper at 1:28, half an hour later. Spiders go from “inert” to “death incoming” almost instantly, even in real time running. 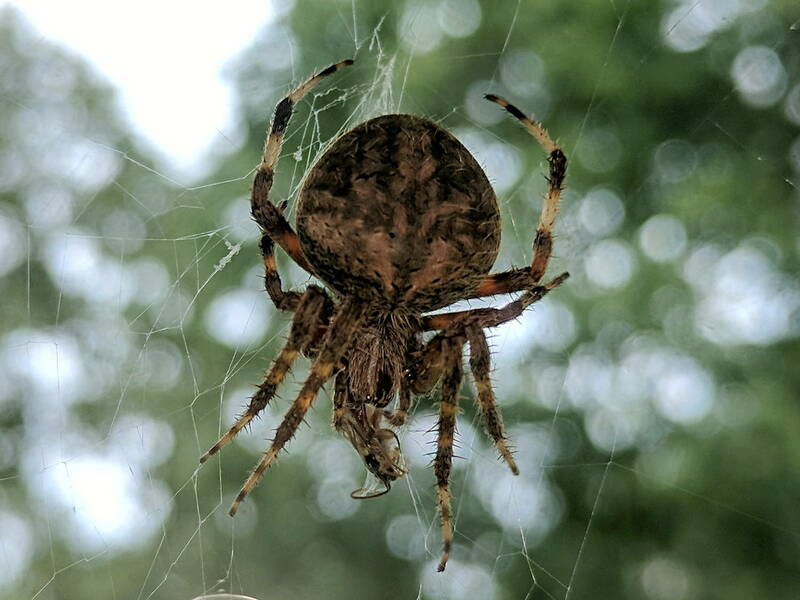 Another orb weaver set up shop in the adjacent window, but moved out the next day. Perhaps there’s a minimum spacing requirement? Two more orb weavers guard windows in the kitchen and laundry room. We sometimes leave the lights on for them. YouTube has other web-building videos with far more detail, of course.